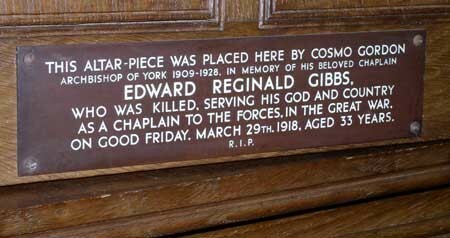 The Reverend Edward Reginald Gibbs, who died on the Western Front near Arras on Good Friday, 1918. He was an Army Chaplain 4th Class, attached to the 1st Battalion, Grenadier Guards. He had apparently been attending the funeral of another soldier when he was killed by a chance German shell. The War Diary of the Guards Brigade reported, “Situation very quiet. Some shelling during morning.” Rev. Gibbs was the only man killed that day from the Guards Brigade, although three officers and seven other ranks were wounded. He was buried at Boisleux au Mont, south of Arras. Reverend Gibbs had a particular link with Bishopthorpe, because he had been Archbishop Lang’s Chaplain until joining the Forces. He was well liked in the village and had been known to take children for hair-raising rides round the village in his motor bike and sidecar. His name is on our War Memorial, but there is another memorial plaque to him which can only be seen once a year on Good Friday. The Archbishop was very much affected by Rev. Gibbs death, and commissioned a wooden triptych in his memory. That memorial still stands behind the alter in St. Andrew’s Church. 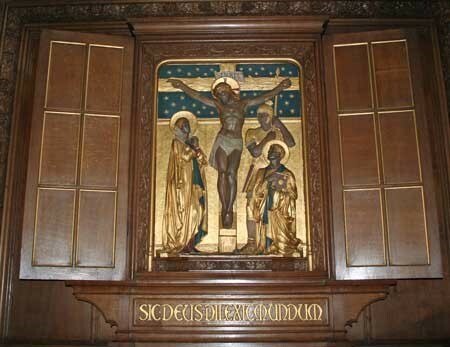 For the rest of the year, the triptych stands open, but on Good Friday, the doors are shut to reveal the inscription to Edward Reginald Gibbs. The triptych in St. Andrew’s Church dedicated to Archbishop Lang’s chaplain, Rev. Edward Gibbs. The Memorial Plaque to Reverend Gibbs which is only on public view on Good Friday when the doors of the triptych are closed. If you happen to be passing St. Andrew’s on Good Friday, take advantage of this once a year opportunity.